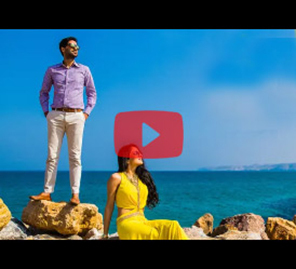 Mitali and Ali’s wedding video titled 'I'm Home' at the sprawling Planet Hollywood resort in Goa will bring a smile to the face of every viewer with its cheery vibe, and the presence of Pantu, the couple's treasured pet who added further swag to this event with every wag of his tail. The film starts with Mitali's voiceover sharing how lucky she is to be married to Ali, as Pantu leads the way to a beautiful white mandap-style structure on the beach which is adorned with bare twigs, foliage and flowers. This is the engagement venue where Pantu endears himself to all by carrying the basket with the rings. The timeline of the film is not linear and shifts back and forth according to the mood of events, rather than the schedule. The beauty of this film is that it successfully captures candid, spontaneous footage that makes one feel like an insider to the #MitAli destination wedding . 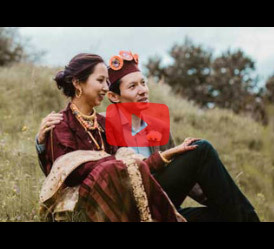 Mitali and Ali have that winsome, youthful energy which makes them bonafide stars of their fun wedding video, ably supported by their cute canine mate. From the stage shows to Mitali on a scooter in all her ethnic wedding finery, the couple on a swing, getting plastered good-humouredly with 'haldi' and petals, crazy dancing, the video is an engaging montage of some of the most memorable moments of their wedding. One of the more poignant moments is when Mitali is shown cuddling Pantu, also in his doggie wedding ensemble, on the morning of her wedding as she is getting ready. Her loved ones help her get ready and emotions are expressed in actions where they kiss and hug her, rather in direct voiceovers. We also see a jubilant Ali doing a jig in his regal wedding finery with a beige and green color scheme. 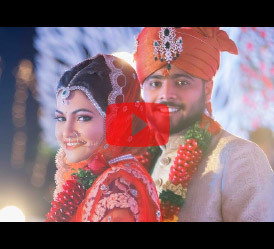 If you are looking for best of Wedding Photographers / Videographers , check out our curated list of WeddingSutra Favorites .